Acetyl L-Carnitite (ALCAR) is the acetylated version of amino acid L-Carnitine. This form of amino acid has the ability to cross the blood-brain barrier. ALCAR works synergistically with Alpha Lipoic Acid. Take two capsules two to three times daily or as directed by medical advisor. L-threonine is an essential amino acid, it can’t be produced in your body. It must, therefore, be obtained from your diet or via supplementation. A deficiency of threonine is often indicated by severe and sudden mood swings and irritability. L-threonine in the presence of pyridoxine (vitamin B6) decomposes into amino acids glycine and acetaldehyde. Acetaldehyde occurs naturally in coffee, bread, and ripe fruit. It is also produced by the partial oxidation of ethanol by the liver enzyme alcohol dehydrogenase. Glutamine is an amino acid produced in your body. It is in fact the most common amino acid in your muscles, making up 61% of your skeletal tissue. 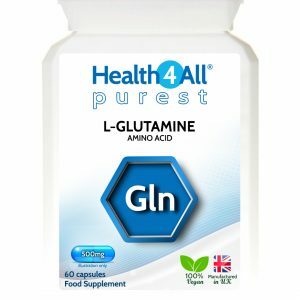 Glutamine easily passes through the blood-brain barrier and is converted inside your brain into glutamic acid. Each capsule provides 500mg of L-Glutamine. Lysine is an essential, proteinogenic amino acid. Because your body can’t produce it you need to take it via your diet or supplementation. The body needs it for hormone production and the growth and maintenance of bones. Furthermore, lysine, with its involvement in protein biosynthesis, works in conjunction with the amino acids glycine and proline to build collagen. Lysine supplementation is a measured way of ensuring correct lysine levels.